Railpictures.ca - Bill Thomson Photo: On September 28th 1963, the Upper Canada Railway Society (UCRS) ran an excursion to Lindsay with Canadian National 4-8-4 steamer 6167, then the train carried on to Haliburton powered by a pair of GMD-1s. Seen here, CN 1915 and 1914 handle the train on a run-by near Kinmount ON, operating on CN’s 55.5 mile long Haliburton Sub (Kinmount is listed in the timetable as Mile 33.4). The GMD-1′s were a special Canadian-only model built by General Motors Diesel Division of London ON for the CN starting in the late 50′s (with a few built for NAR). Essentially an SW1200RS with a short hood, the 1900 series of 20 units were equipped with B-B Flexicoil trucks and steam generators to be used in commuter and local passenger service out of Toronto’s Spadina Roundhouse and other points across the CN system (1900′s were commonly used to switch passenger trains at Winnipeg’s Union Station). Note: geotagged location not exact. | Railpictures.ca – Canadian Railway Photography – photographie ferroviaire Canadienne. Caption: On September 28th 1963, the Upper Canada Railway Society (UCRS) ran an excursion to Lindsay with Canadian National 4-8-4 steamer 6167, then the train carried on to Haliburton powered by a pair of GMD-1s. Seen here, CN 1915 and 1914 handle the train on a run-by near Kinmount ON, operating on CN's 55.5 mile long Haliburton Sub (Kinmount is listed in the timetable as Mile 33.4). The GMD-1's were a special Canadian-only model built by General Motors Diesel Division of London ON for the CN starting in the late 50's (with a few built for NAR). Essentially an SW1200RS with a short hood, the 1900 series of 20 units were equipped with B-B Flexicoil trucks and steam generators to be used in commuter and local passenger service out of Toronto's Spadina Roundhouse and other points across the CN system (1900's were commonly used to switch passenger trains at Winnipeg's Union Station). Note: geotagged location not exact. Rare mileage – even in 1963! The Victoria Railway – completed 1877 to Kinmount, then on to Haliburton. Interesting route with the railway on the east shore of Cameron Lake – beside numerous cottages (north of Fenelon Falls). UCRS did a repeat of this trip in October 1966 (67?) with 6218 to Lindsay, and on to Haliburton with GMD1′s. 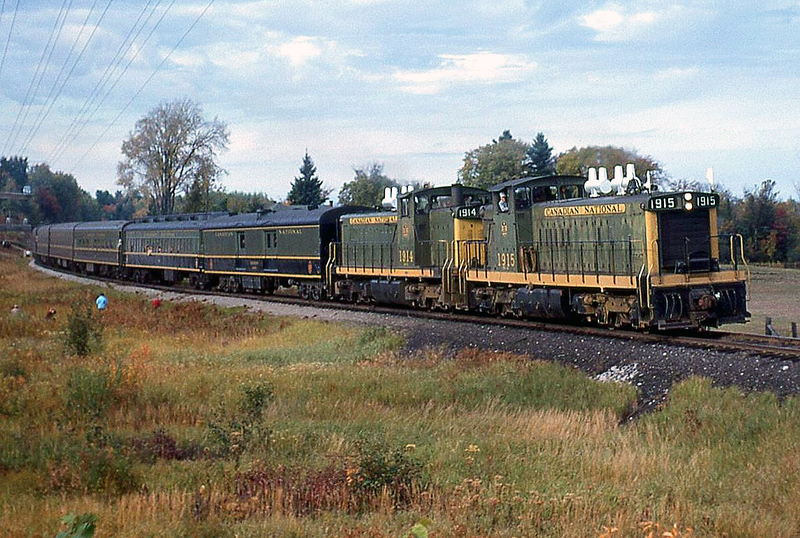 Included in the consist, new to CN (purchased 1964), was an ex Milwaukee Skyview ( 8 double Bedroom, 14 chair lounge) glass roof boat tail end, CN #1900 to #1905 (Mahone; Malpeque; Fundy; Trinity; Baddeck; Gaspe) – normally assigned to the Super C and Panorama west of Winnipeg only! This runpast likely just north of Kinmount – one of the few locations north of Fenelon Falls where farm fields are close to the railway. sdfourty.